Products high in salt and saturated fats are being marketed as healthy by leading supermarkets, BBC Radio 5 Live Investigates has found. The British Dietetic Association said stores including Tesco, Morrisons and Sainsbury’s were being “unhelpful” and “confusing” customers. The Royal Society for Public Health called for an independent supermarket regulator. Supermarkets said they were committed to “promoting healthy eating”. BBC researchers visited the top five supermarkets in the UK and found Sainsbury’s, Morrisons and Tesco were stocking products high in salt and saturated fat in sections marked “healthier choices” and “healthy and diet meals”. Morrisons’ “healthier choices” section contained a vegetarian steak slice with almost 10g of saturated fat – nearly half of the recommended maximum daily amount. The supermarket said the item “provides customers with a red-meat free alternative”. 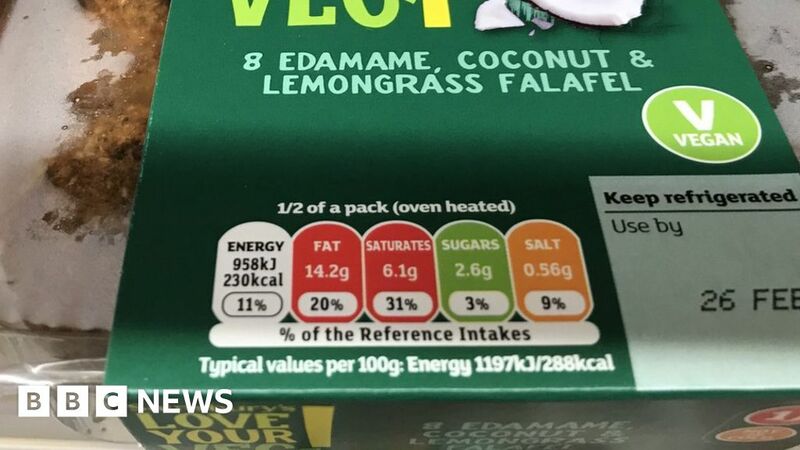 Sainsbury’s edamame, coconut and lemongrass falafel contained more than 6g of saturated fat per half pack – around a third of the recommended maximum daily amount – and was located in their “healthier choices” section. In Tesco’s “healthy and diet meals” section, a “lamb hotpot” contained 8.5g of saturated fat, 45% of the recommended maximum daily amount. Registered nutritionist Charlotte Stirling-Reed said she was “quite shocked” at some of the items being marketed as ‘healthier choices’. The Royal Society for Public Health (RSPH) said many products are being identified as “healthy” because they are vegetarian, vegan, free from certain ingredients, or have fewer calories. But, it said, many have high levels of fat, salt or sugar, and are highly processed. “Supermarkets should be transparent about how they classify foods, and provide clear information about products,” the RSPH added. “There must be incentives and penalties for presenting clear and accurate information. A British Dietetic Association (BDA) spokesperson said supermarkets had a “duty of care” to their customers. “It is unhelpful and confusing to the consumer, and supermarkets should avoid doing this,” they added. Morrisons’ own brand lentil hotpot contained almost a third of the recommended maximum daily amount of salt – almost 2g – but was stocked in the “healthier choices” section. Smoked meat substitute slices marketed as healthy in Sainsbury’s contained almost two grams of salt per four slices, making them more salty than seawater. Action on Salt, which campaigns for a reduction in the consumption of salt, said it was very time-consuming for shoppers to check every label to find a healthier option. “Placing products in ‘healthier choice’ sections of supermarkets should ideally highlight products that are actually better for our health,” it said. “However, we’ve found that many of the vegetarian and vegan products in these sections of the supermarket can be high in salt, with some vegetarian burgers containing more salt than real beef burgers, meaning shoppers are being given a false sense of security. Council trading standards officers enforce food safety laws that cover health and nutrition claims in individual supermarkets. Hertfordshire and West Yorkshire trading standards services – the principal trading standards partners for Tesco and Morrisons – told BBC Radio 5 Live Investigates they will be making further enquiries with both supermarkets. It added that all nutritional information is clearly listed on packaging. It said it was committed to helping customers live “healthier lives”.